It never ceases to amaze me how awkward I am at making small talk. I go to events around town all the time, and I always go with the best of intentions to meet new people and hear their stories. But then reality sets in when faced with a room full of people. I know there are many guides out there about networking for introverts, but those guides always involve actual networking. Whatever. They don’t know me. Anyway. 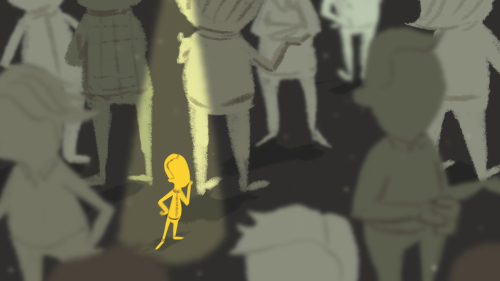 I put together my own tips for surviving crowds — like a “for introverts by introverts” kinda thing. If you follow my advice, you’ll make it successfully to the end of your event and still have energy left for whatever disaster awaits you at home, be it cat disaster or kid disaster. Use the bathroom often. I’m sure no one will think you have IBS. Get another glass of wine. Duh. If someone attempts a conversation in line, you can at least make small talk about that time a glass of red gave you hives. Circle the perimeter of the venue multiple times. Be sure to stop every few steps and act like you’re looking for someone, or you might get a visit from security. Occasionally cross the diameter of the venue as if you see someone you know across the room. This also throws off security. Hover awkwardly near a group of 5-7 people. To others, you’ll look like you’re in the group, but the group won’t notice you standing there. Wander over to see what your spouse is up to if your spouse is someone who talks to people. You can stand there quietly for several minutes before someone thinks to introduce themselves. This only works if you bring your spouse. Consult your smart phone periodically to track the event hashtag or check the number of likes on your snarky Facebook post about going to the event you’re at. So there you have it — my expert advice for introverts. If you try any or all of these tactics, please comment and let me know how it goes. It’s nice know you’re not alone. While most of the animated videos we produce explain ideas, software, and services — animation is also an effective tool for telling the story of your physical product. After all, your product solves a problem for your customers just like any service or software does, and that’s the kind of story animation nails every single time. The Naked Experience. When traveling away from the comforts of home, cold bathroom floors, scratchy towels, and stiff bedding are a drag. It’s a timeless problem Pineapple Hospitality solves with its soft, fluffy bedding, towels, and slippers! OTO Home. The story of a tired and busy parent is timeless, and we didn’t have to find a real baby to tell this story! Skorpion. A video about a phone charger had the potential to be a real snoozer, but we used animation to personify the struggle of an unhealthy phone, which made it much more interesting. AirQ. Animation helped us tell the story of scenting techniques throughout history and made the science of it more accessible. Dreampak. Animation was beneficial for showing how the nutrients flow through the body. And also, we didn’t know anyone whose hands could move that fast.